The second week in Quebec has been a lot more fun. That’s not to say I didn’t enjoy my first week, but I’ve been able to focus more on the exciting things this week, like my job! Moving to a new studio can be stressful as hell. Lots of new names and faces to learn, new tools to acclimatise to, and new projects to learn about, are some of the major hurdles you’ll have to overcome. That’s all been really easy for me here. I feel like I’ve settled in really well. Sure, I don’t know everyone, but that’s a long term thing as this is not a small studio. As I arrived, Canada was just saying goodbye to Autumn (or fall as they like to call it here) and welcoming the cold embrace of Winter. I’ve been told numerous times that Canadian Winters are particularly brutal. Lots of snow, and temperatures well below zero are the norm out here for months on end. When I lived in Poland the Winter’s got pretty cold and there was snow, so I am a little used to it, but compared to England this kind of weather is apocalyptic. Seriously, England would just declare the end of the world and shut down everything if it was ever like this. I wanted to prepare for winter coming. I ordered myself a proper winter coat and snow boots. I decided to invest in some high quality ones that would last me many winters, so after a few nights of research I settled on The North Face. I have to say it was a smart move and a wise investment. The day after they arrived the snow came. I can barely feel the cold through my parka. It has a layer of goose down which keeps the heat in, and the outer layer keeps the wind and wet at bay. If you’re moving to Canada, don’t be tempted to buy cheap alternatives. Invest in a good pair of boots and a good winter coat. You will not regret it. 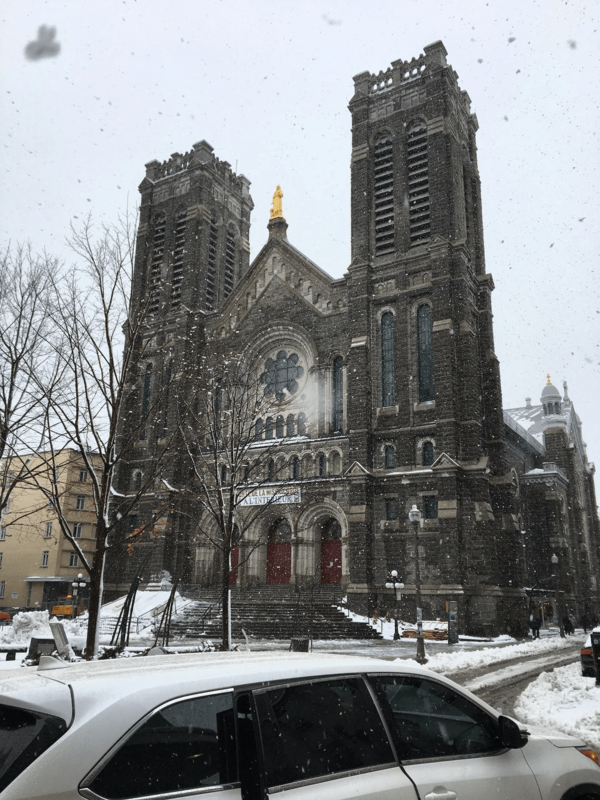 I will say that this city is beautiful and that effect is only amplified when it’s covered in a layer of thick snow. With the weather getting worse and money being tight due to pay cut-off dates working against me (and being unexpectedly unemployed for two months whilst waiting for my visa) I decided it was a good idea to go to the supermarket and buy myself a stockpile of groceries. I always find adjusting to new supermarkets in different countries one of those things you don’t think about until you’re stood in one. I entered the local supermarket near my apartment and the dread of the unknown hit me all at once. Where was everything? How was this place laid out? What brands would I recognise and which ones would be good replacements? Could I read the labels? All these questions you don’t even think about when you’re on food acquisition auto-pilot, wandering around your familiar shopping places putting items in your trolley. I won’t go into too much detail about my supermarket experiences. Thanks to the Canadian bi-lingual nature, the label thing was not an issue, and I’m familiar enough with American brands to make shopping relatively simple. It took me a fair bit longer to find some things though. Tuna was weirdly difficult because there was about fifty different types of canned Tuna. The two things that really stand out for me about American/Canadian grocery shopping is the variety and size of things. It’s crazy to me that things come in such vast quantities. Ketchup comes in 1L bottles. Tortellini comes in 1KG packets. Everything is bigger, but I understand why. Everything is so spread out here that people don’t pop to the supermarket every few days to top up, they buy in bulk because a journey there is more of an ordeal. Things are cheaper in bulk as well, so there’s that to consider. The common thing to do seems to be buy your major ingredients in bulk, then get the occasional top up of the bits you run out of before the next mega shop. You can also have groceries delivered to your door like in the UK, so there’s always that option. I do have to mention briefly the French influence on supermarkets here in Quebec. I was afraid that a lot of food out here would be the typical American processed crap. The reality is thankfully quite different. The supermarkets here are filled with fresh veg (which is also enormous by normal standards) and plenty of high quality, ethically sourced local produce. There’s plenty of fresh fish too, including some still living in the form of live lobsters who just chill out in a glass tank in the middle of the fish area. Overall they have a great variety of fresh food, long lasting stuff, and some frozen food. I like the lack of frozen meals and ready made crap over here. the freezer section was very small and was made up mainly of pizzas. There’s also a lot of choice for people who are vegetarian, vegan, with additional options for those with intolerances to gluten or lactose. 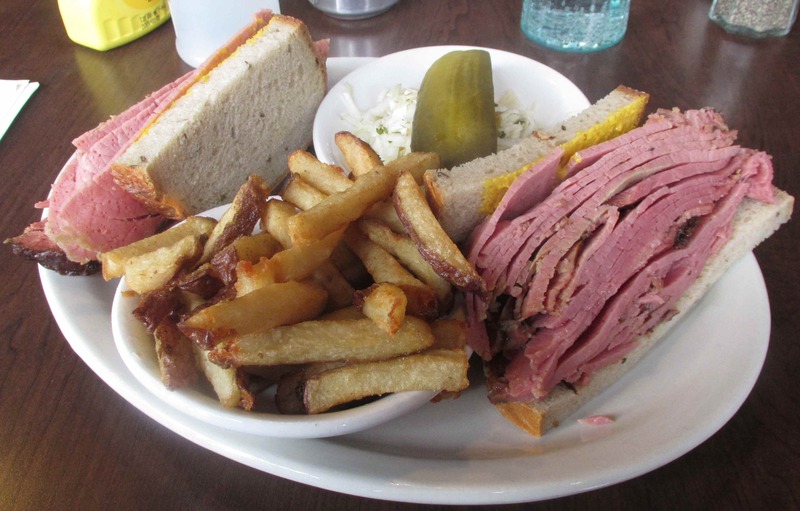 The last thing I want to mention is a regional favourite out here called the Montreal- style smoked meat sandwich. They’re incredible! It’s a type of kosher-style deli meat product made by salting and curing beef brisket with spices. The brisket is allowed to absorb the flavours over a week, and is then hot smoked to cook through, and finally steamed to completion. It’s served on fresh bread with mustard and I add some mayo too. As far as sandwiches go it’s pretty amazing. If you come out here be sure to try one, or twelve. That’s all for this week. I think I’ll take a break from reporting on my expat adventures for a while and go back to discussing other things, at least until I have enough stuff to talk about. Life in Canada is pretty good so far and I can’t wait to see what the future has in store.